You are at:Home»Ireland»Ireland Women»Ireland Women Sevens»The FRU Player of the Women’s Paris Sevens and Tournament Dream Team. 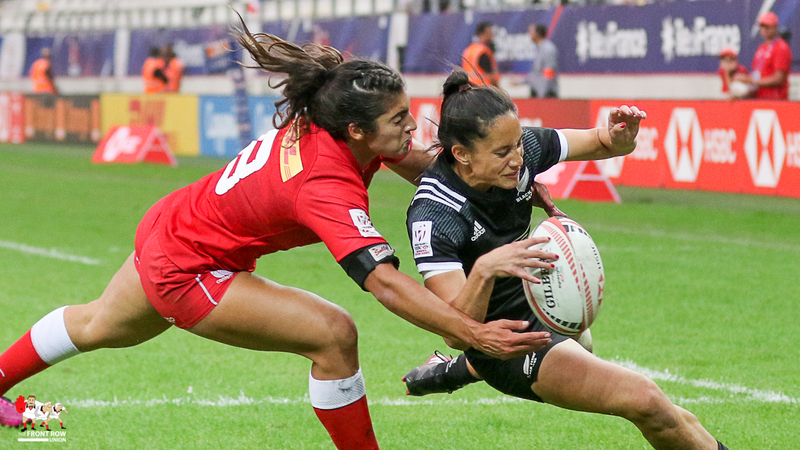 HSBC World Rugby Women Sevens Series 2018 - Paris. Men Day 2, Saturday 9th June 2018, Stade Jean Bouin. During the two days we were at the Women’s Paris Sevens we took over 18,000 photos for the 27 Women’s games we covered. Having worked through all those photos there was one player who appeared consistently in attack and defence and that player was Canada’s Bianca Farella who picks up The Front Row Union Player of the Tournament accolade. Farella passed the 100 tries scored mark in this tournament, but it was her tenaciousness in defence that cropped up time and time again in the camera’s viewfinder, this last minute try saving tackle pictured below just one of many. Canada’s Bianca Farella makes a remarkable try saving tackle to dislodge the ball from Gayle Broughton in the act of scoring. Worthy of note is Ireland’s Eve Higgins with the 18 year old particularly impressive with her powerful and committed running and her eye for a break. The Front Row Union Paris Sevens Dream Team. Previous ArticleVicky and Beth do the Paris Sevens!